The formation of Domaine La Boutiniere dates back to 1929 when the estate was created by Felix Vidal. At the time, the harvest was sold to negociants. It was not until 1981 that Domaine La Boutiniere began to produce, bottle and sell their own wines. In 1997 the property was sold to Frederic Boutin, who owns and manages the domaine today. After purchasing the vineyard, Frederic Boutin changed the name of the winery to reflect his new ownership. Domaine La Boutiniere owns 10 hectares of vines that are divided into 8 parcels spread over the Chateauneuf du Pape appellation. 9.5 hectares are used for growing grapes to produce red Chateauneuf du Pape wine. .5 hectares are served for white wine varietals. Like many Southern Rhone estates, the vines are scattered around the appellation. Domaine La Boutiniere has planting of most of the 13 allowable grape varietals. They have old vines. Their oldest Grenache vines date back almost 120 years! Domaine la Boutiniere produces 2 red Chateauneuf du Pape wines and one Chateauneuf du Pape Blanc. Domaine La Boutiniere Tradition is made from a blend of 70% Grenache, 15% Syrah, 10% Mourvedre and 5% Syrah. Minor portions of other varietals are also included as they are part of the field blend. The terroir is rocks, stones, sand and clay soil. The wine is aged in old foudres, demi-muids and tank for 12 months before bottling. On average, the production is close to 1,400 cases per year. Domaine La Boutiniere Grande Reserve which made its debut with the 2000 vintage is produced from 90% old vine Grenache that is at least 100 years of age. 5% Mourvedre and 5% Syrah complete the blend. The terroir is sand, with some rocks and stones. The grapes are partially destemmed. 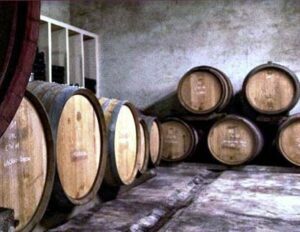 The wine is aged in a combination of old barrels and foudres for 18 months. On average, the production is 350 cases per vintage. Domaine La Boutiniere Chateauneuf du Pape Blanc is made from a blend of 70% Clairette, 10% Grenache Blanc, 10% Roussanne and 10% Bourboulenc. The wine is aged for 6 months in 90% stainless steel tanks and 10% new, French oak barrels. Domaine La Boutiniere can be enjoyed on the young side. Young vintages can be popped and poured, or decanted for 1 hour or less. This allows the wine to soften and open its perfume. Older vintages might need very little decanting, just enough to remove the sediment. Domaine La Boutiniere is usually better with 1-3 years of bottle age. Of course that can vary slightly, depending on the vintage. In the best vintages the wine should be consumed within 2-8 years after the vintage. Domaine La Boutinere is best served at 15.5 degrees Celsius, 60 degrees Fahrenheit. The cool, almost cellar temperature gives the wine more freshness and lift. Domaine La Boutinere is best served with all types of classic meat dishes, veal, pork, beef, lamb, duck, game, roast chicken, roasted, braised, stewed, dishes, sausage and cassoulet. Domaine La Boutinere is also good with Asian dishes, hearty fish courses like tuna, mushrooms and pasta. The white wine of Domaine la Boutinere is best served with a myriad of different seafood dishes, shellfish, crab, lobster, sushi, sashimi, chicken, pork and veal, as well as Asian cuisine. The old vine Cuvee from La Boutiniere kicks off with flowers, raspberry and kirsch. Medium bodied, with a bright quality to the berries, there is a strong olive component in the finish. Forward, and perfect for early drinking, the wine combines herbs with fresh, sweet, bright red fruits. Forward, light and already easy to taste, this blend of Grenache with Syrah and Mourvedre, along with other varietals shows off a spicy, kirsch filled charm with a fresh, peppery, medium bodied, herb tinged finish. Sweet, round, long, spicy and fresh, this bright red berry wine will be best to drink young. Finesse styled, with bright red fruits that finishes with light, sweet cherries. Medium bodied and forward, with a spicy kirsch and herb character, this soft, easy drinking wine will probably be best on the young side. Medium bodied, early drinking, bright, red berry dominated wine without excitement, or faults.